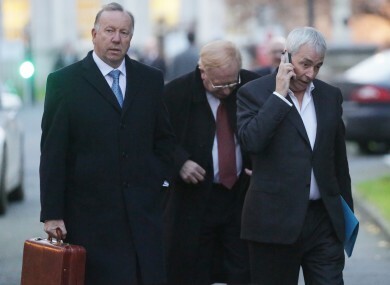 David Martin, former CRC Director; James Nugent, former Chairperson, and former CEO Paul Kiely leave a Public Accounts Committee meeting in December 2013. A NUMBER OF former board members from the Central Remedial Clinic who were invited to attend a meeting with the Public Accounts Committee today will be absent. PAC Chair John McGuinness confirmed that former CRC Chair Jim Nugent would not be in attendance, nor will former executives David Martin and Brian Conlan. The three last appeared before PAC in December and January, when there were numerous revelations about salaries and pay-offs at the clinic. Nugent and Martin will not be attending as they are in the UK and Italy respectively. Earlier this week, Conlan’s solicitors questioned him being called as a witness and whether or not it was under the remit of the committee to investigate how taxpayers’ money and public donations were used to top-up executive salaries at the charity. McGuinness said that today’s meeting will “give us the opportunity to tease out some of those issues”. Former chair Hamilton Goulding will attend, as will his successor Kieran Timmins and current CEO Stephanie Manahan. Paul Kiely, former Chief Executive, is not attending due to ill health. The HSE revealed in January that Kiely was paid a total retirement package of €742,025. All members of the board of governors at the clinic resigned at the request of the HSE last December, following a controversy over the use of charitable funds to top up salaries in excess of Department of Health pay scales. PAC’s members are also currently trying to compel former Rehab Group executives Frank Flannery and Angela Kerins to appear before them to discuss similar issues surrounding salaries and top-up payments. A report published last month by former interim administrator John Cregan said that the CRC set up its charitable arm for the sole purpose of receiving as much money as possible from the HSE. At the time, Hamilton denied this was the case and said the report “exonerates CRC of wrongdoing allegations”. Cregan will be in attendance today, as will Laverne McGuinness, HSE Chief Operations Officer, and Pat Healy, HSE National Director of Social Care. If there are still questions remaining [after today's meeting] we can call on Mr Nugent and Mr Martin and Mr Kiely to re-attend. He added that it was now “more important to talk to the HSE in relation to their failure to monitor, over many years, the section 38 and 39 grants”. In a statement released yesterday evening, McGuinness added that the HSE had many lessons to learn from the report. There are clearly lessons for the HSE in terms of its oversight of all voluntary bodies, and in this respect the committee will be keen to assess how its procedures can be enhanced. The Cregan Report highlights the deficiencies in the HSE funding model, which did not directly link costs and the specified outputs and prices. He said it should be noted that the report underlined that the CRC was “on the whole a well-run body with the exception of a number of governance issues, served by an excellent staff”. The meeting, which can be watched here, will commence at 1oam in Committee Room 1. Email “PAC will be discussing the CRC today, but who is going to turn up?”. Feedback on “PAC will be discussing the CRC today, but who is going to turn up?”.